Groan – It’s hard to write this post when I’m still so full from dinner… four hours later! But if I had it to do over again, I’m sure I’d still wind up eating way too much. My husband, Morgan, and I got back into town yesterday evening from a few long and difficult days. Thanks to everyone who sent good thoughts our way. Getting back into the swing of things, my cooking/baking wish for the next week is that I’ll avoid baking at least until Easter because I indulged in way too many delicious and fattening things at northern bakeries (ever had Checkerboard Cake? We bought some after my dad exclaimed that he used to enjoy it from time to time while growing up. I had never had it before, and now you can bet I’ll be trying to make it soon). So today was mostly comprised of cleaning up the apartment, organizing for the week, grocery shopping and decompressing. The weather was gorgeous, and Morgan and I decided to pick up some pizza dough from the nearby Italian Store (I’ve mentioned here before that they have outstanding dough). 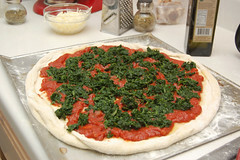 We bought ingredients for a spinach and mushroom pizza, but this time we made the sauce from scratch using my mom’s excellent marinara sauce recipe. It’s recently become an obsession of ours to make this sauce for spaghetti, chicken, pizza and anything that could possibly use marinara sauce. 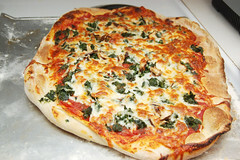 I have to say this is our finest pizza yet. Making this sauce from scratch is so easy and probably less expensive than buying ready made sauce. We have leftover sauce, so we keep it in an air-tight container in the fridge; it should keep for the week. The spinach was also a great addition and doesn’t call a lot of attention to itself. I’ll also repeat myself and say how you really need to find a local (non-chain) pizza shop in your area and try to buy a bag of dough. 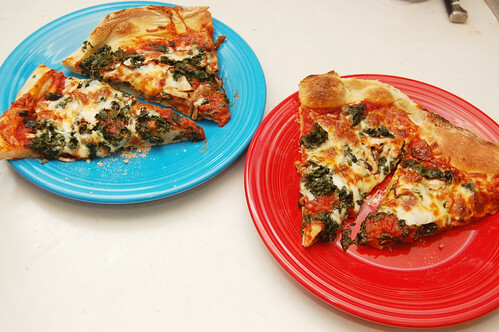 Waiting to try making your own pizza is just depriving yourself of some of the best pizza you’ll ever have! For sauce – Add olive oil to a medium saucepan set to medium temperature. Add garlic and onion and cook until tender, about 5 minutes. 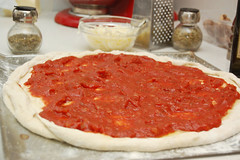 Stir in crushed tomatoes and tomato paste and add remaining ingredients. Reduce heat to low; cover and cook for 30 minutes, until mixture is thickened. Stir occasionally. Makes about 3 cups of sauce. In the meantime, preheat oven to 525 F and cook spinach according to package instructions in a small saucepan. Saute sliced mushrooms in a separate small pan for 2 to 3 minutes. 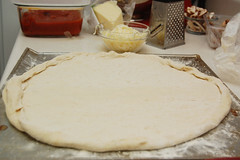 When sauce is just about done, flour a cookie sheet and roll out dough to a 16 inch circle. Drizzle olive oil over the dough. 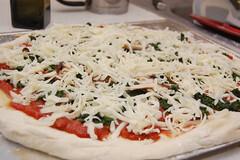 When sauce is done, pour and smooth sauce over pizza dough, followed by spinach, mushrooms and cheese. 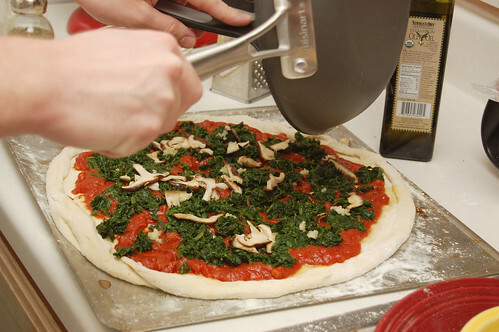 Transfer cookie sheet to oven and cook for approximately 11 minutes (we use a pizza stone, so we preheat the oven with the pizza stone in the oven, then carefully transfer the uncooked pizza to the heated stone. 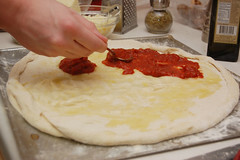 It takes two of us to transfer the pizza without letting it fall apart, so proceed with caution if you go this route). 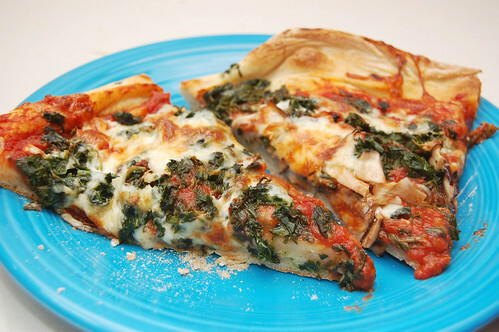 Let pizza cool for 2-3 minutes. Slice and serve! 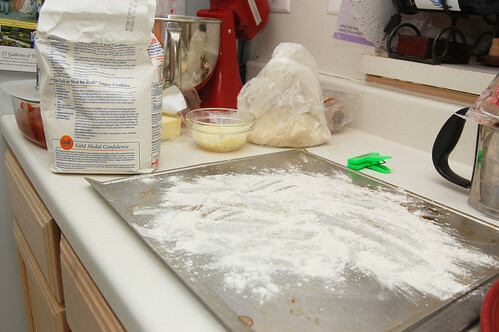 « Kitchen Tips – What the heck does "picked over" mean?